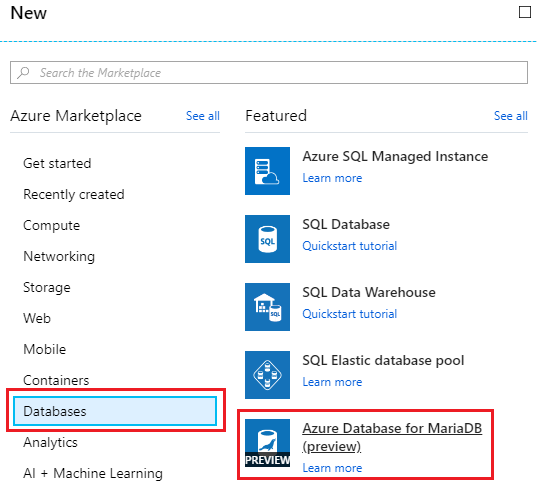 We will create a MariaDB database service in Azure and connect MariaDB in a Single Page Blazor application. Azure Database for MariaDB is a relational database service in the Microsoft cloud. Azure Database for MariaDB is based on the MariaDB community edition database engine. 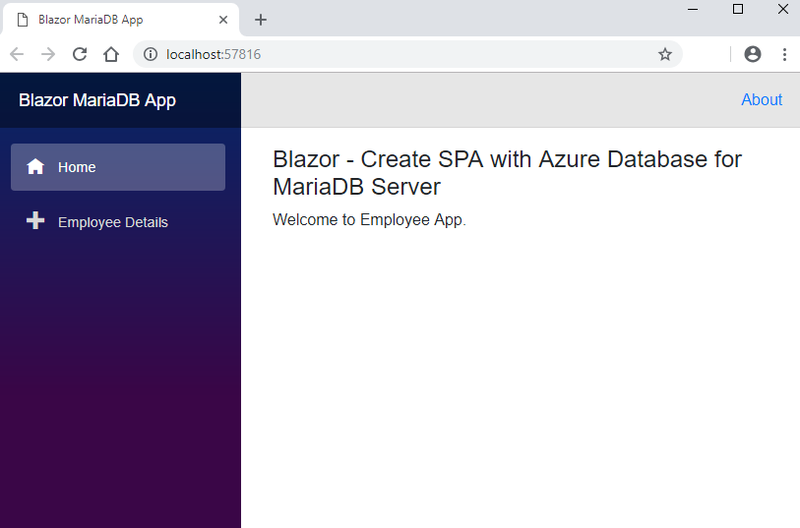 In this article, we will create a MariaDB database service in Azure and connect MariaDB in a Single Page Blazor application. Azure Database for MariaDB is a relational database service in the Microsoft cloud. This service is currently in public preview. Azure Database for MariaDB is based on the MariaDB community edition database engine. MariaDB Server is one of the most popular database servers in the world. MariaDB turns data into structured information in a wide array of applications, ranging from banking to websites. It is an enhanced, drop-in replacement for MySQL. MariaDB is used because it is fast, scalable and robust, with a rich ecosystem of storage engines, plugins, and many other tools make it very versatile for a wide variety of use cases. It’s made by the original developers of MySQL and guaranteed to stay open source. Please refer to this URL to get more details of MariaDB. I have already written many articles on Blazor in C# Corner. If you are new to Blazor framework, please refer to the below articles to get a basic idea of Blazor. We can give a name to the MariaDB server. Also, choose the resource group name. If you do not have any resource group, you can create a new one. You must give the server admin login name and password. You can choose the pricing tier. I chose the Basic tier. After selecting the pricing tier, you can click the “Create” button to create the DB server. It will take some moment to create the server. We must add the IP address in Connection security to access MariaDB from outside Azure. You can choose “Connection security” tab and add Starting IP and Ending IP address. Here I added minimum IP address and maximum IP address. Because my system IP address often changes. But in production, we can give the exact IP address. I am using MySQL Workbench to connect MariaDB for creating Database and Table. Most of the MySQL admin tools also support MariaDB. You can download free MySQL community edition from this URL. Please give connection name, hostname, username in the workbench. You can get the hostname and username from Azure portal. You can also store the password as Vault. It is fully secured. We can create a new database and table using Query editor. Here I am creating an Employee table with five columns. We have successfully created a MariaDB server and created one database and table. In this article, we will create an Employee data entry single page application. I am using free Visual Studio 2017 Community edition for creating a Blazor application. 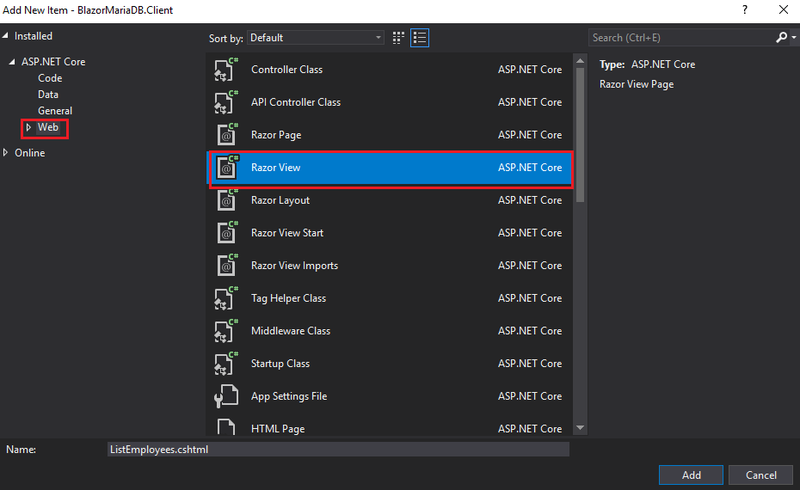 Currently, there are three types of Blazor templates available. 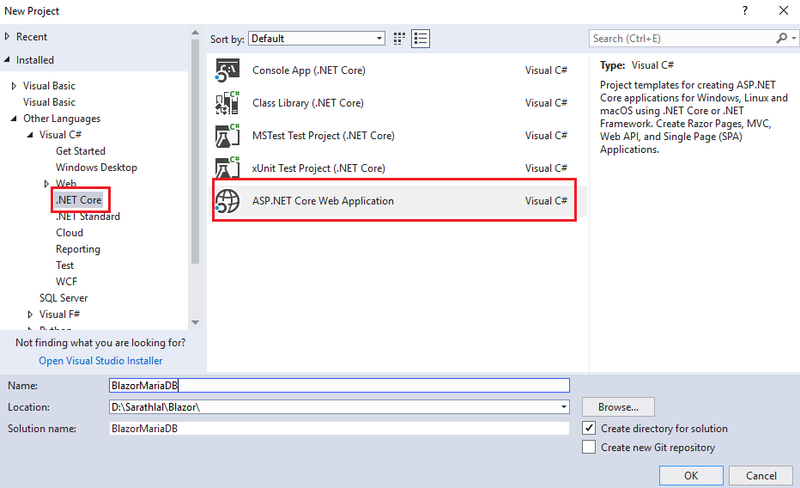 We choose Blazor (ASP.NET Core hosted) template. Our solution will be ready in a moment. Please note that there are three projects created in our solution - “Client”, “Server” and “Shared”. We can create a Models folder in “Shared” project and create Employee class inside this Models folder. As I mentioned earlier MariaDB is developed from (forked) MySQL. We can use MySQL providers to connect MariaDB in .NET. We can install “MySql.Data” NuGet Package in “Server” project. This packaged is developed by Oracle corporation. We create a “DataAccess” folder in “Server” project and create MariaDBContext class inside the DataAccess folder and add all the CRUD operations logic inside this class. We will call the methods in this class from our Controller class later. We have created each method for CRUD actions inside this class. Please note we are using “MySqlConnection” class from “MySql.Data” library to connect MariaDB. We can inject the MariaDBContext service in Startup class. For simplicity, I have hard corded the connection details inside Startup class. You can even keep these connection details in a separate configuration file. We can create Employees controller now. We can add the below code in this controller class. We have added all the CRUD operations in this controller. We are calling methods from MariaDBContext class in this controller. We can go to “Client” project and modify “NavMenu.cshtml” Razor view. 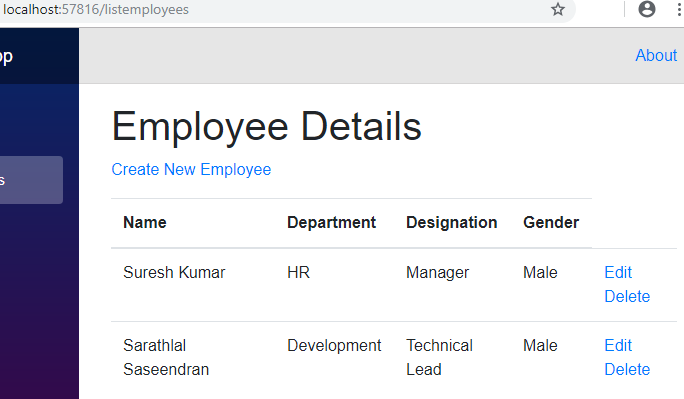 We can create a new Razor view for listing employee details. We have completed all the coding part. Now we can run the application. We can click the Employee Details link in the menu bar. It will open the Employee List page. There is a Create Employee Link. You can click that link. It will open Add Employee page and here you can enter the employee details and “Save” button to save the information. 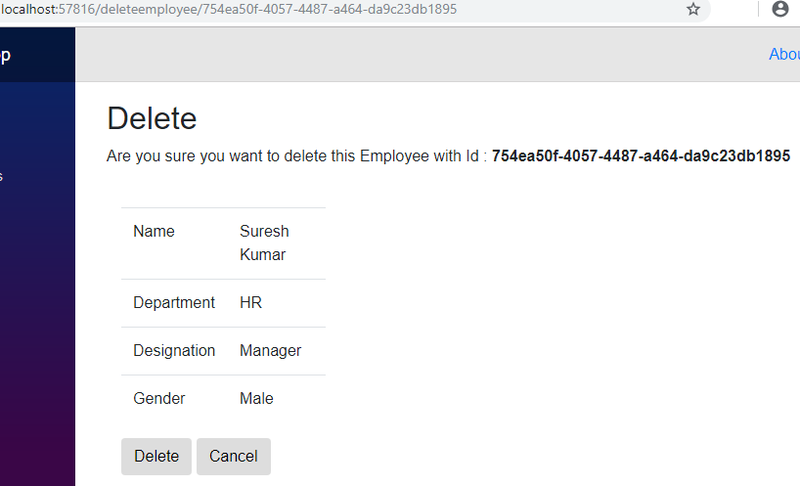 It will display the selected employee details for a confirmation and if you click “Delete” button employee data will be deleted from the table. We have seen all the CRUD operations with employee data. In this article, we have created an Azure Database for MariaDB server and we have also created a firewall rule to access this MariaDB server from outside Azure. Later we created a new database and table in MariaDB using MySQL workbench (we used workbench free community edition). We have created a Blazor application using Blazor (ASP.NET Core hosted) template. We used MySQL.Data NuGet package to provide data access from Blazor to MariaDB server. We have successfully created two employee records and have seen how to modify and delete this employee data. We can see more Blazor features in upcoming articles.